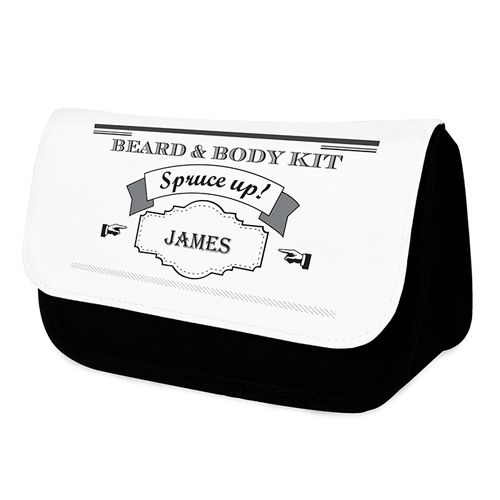 Our Spruce Up Wash Bag is a wonderfully unique gift for him on any occasion. Personalise with a name up to 12 characters including spaces and punctuation. Personalisation will appear in UPPERCASE. The text "Beard & Body Kit" and "Spruce up!" is a fixed part of the design. Please refrain from using special characters as this may impair the quality of the personalisation. Our wash bags features a main compartment and two separate compartments inside all of which are secured with a Velcro close, the main body of the bag is a woven polyester.